Like other integrations, you need to be an admin in order to enable the Shopify integration. The Shopify integration allows you to display information about your customers when it's available in Shopify. The integration does not work with SMS at this time. Go into your Settings and select Integrations. Scroll down the list, and click on Shopify. Turn the toggle on to enable Shopify. 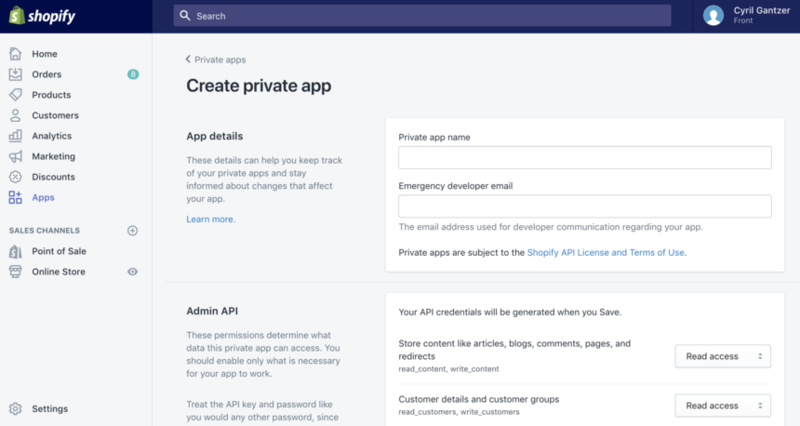 Retrieve your Store Domain, API key, and API password by logging in to the Shopify website. You may add multiple stores as well. The Store Domain can be found in your store's admin URL that comes before .myshopify.com. Do not include the "https://" or the ".myshopify.com." - only the string in between those is used for the Store Domain in Front. Now you need to generate an API key and API password. To do that, go to Apps, and then click Manage private apps. Select Create a new private app. Give your app a name. We suggest something like Front for future reference. Then click Save. Copy and paste the API key and API password into Front. If you need to connect multiple Shopify stores with Front, use the + sign to add a store. Repeat steps 4-8 to generate API keys and passwords for all your Shopify stores and enter them in Front. Click Save to finish enabling the Shopify integration. 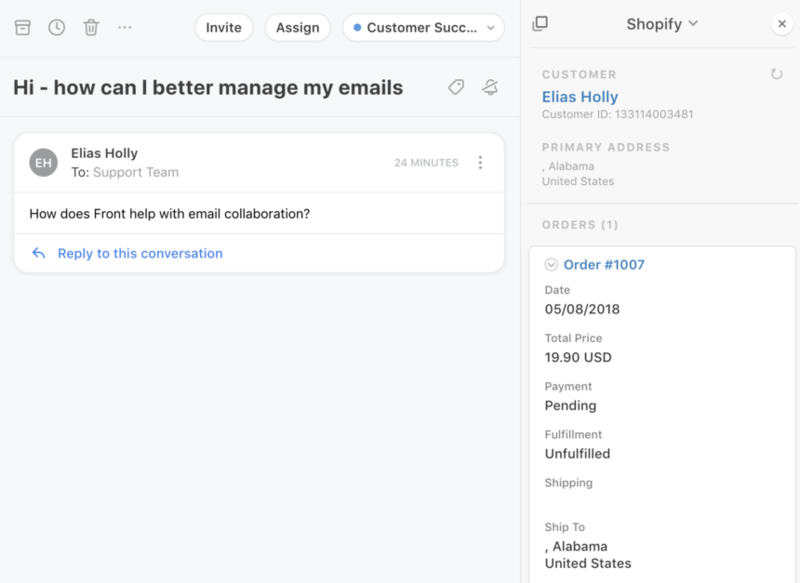 You can now display information about your customers and their orders directly in Front. Open the right pane by clicking on the arrow located on the top right corner of your Front interface. You will be able to see the information available in Shopify and tied to the current message in Front. The links will take you to the respective pages in the Shopify interface. You can also switch to a different store in your plugin pane. Any chance we can change the info that are displayed ? Le Petit Lunetier Not at this time, but I'll go ahead and share this request with our Product team. Hello Cori Morris ! Indeed, it would be great to have the tracking number, number of order by the customer,.. that displays on the app. Do you have any update about when those features will be available? We don't have a timeline for this request yet, but once we have an update we will update you! Cori Morris Have the fields been updated so that we can view/add fields? Adam Metz Not yet. I'll be sure to let you know when they are. Cori Morris Is there a rough ETA (e.g. 2019)? Adam Metz Hopefully this year, but it's not scheduled yet, so I can't provide an ETA. I too wish to have more information added on the shopify integration. - Tracking number and Tracking URL are both very important, especially for 'Where is my order' queries. I have attached a screenshot of how a competitor has accomplished this task, essentially the tracking number itself becomes the clickable URL so as to reduce the height of the widget. Tracking url is a standard variable that is within the shopify API as are order notes so should be a pretty straight forward addition to the current one. 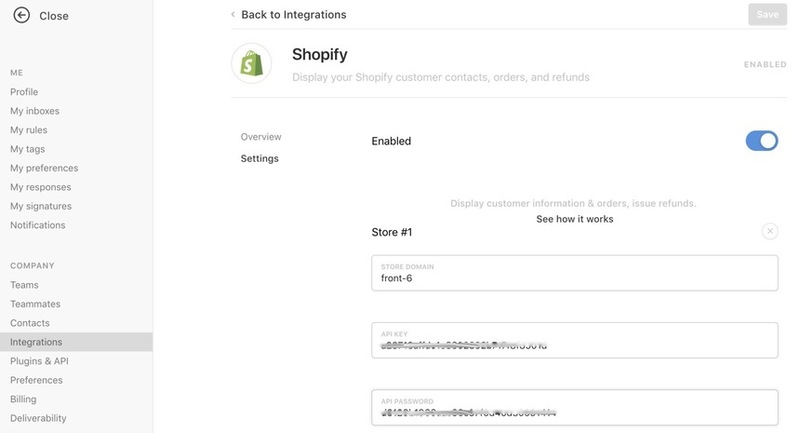 Many of you have asked to display tracking numbers in the Shopify integration in Front. In case you're still interested in the feature, this is now available! Please refresh your app and you'll see it. You can click it and it will take you to the tracking URL. Hope you like it! Urszula Hi sorry only just seen this - not sure how it relates anyway dont need calendar requests? Cori Morris Is there any news in adding this functionality to the mobile app - I notice on the mobile app it seems as if it is setup for this as there is a View Plugins menu on a contact but I guess this has been blocked to show shopify? Also is there any chance of adding extra data to this integration, I have additional line item properties on customer orders that I have to bring into front via Zapier currently. Just seems an unnecessary expense when it should be as simple as adding it to your current api integration with shopify? Hi Tom thanks for your feedback. That is not something that we have a timeline to share right now but it is something that future updates should help with. I know that is vague in terms of timeline but I wanted to let you know that we're aware and it's something we want to improve down the line.